Oak Ridge, Tenn. — A residential and commercial tower under development in Brooklyn, that is changing the New York City skyline has its roots in research at the Department of Energy’s Oak Ridge National Laboratory (ORNL). The tower’s white precast concrete façade rising from the waterfront site of the former Domino Sugar Factory evokes the form of a sugar crystal – a pattern created from 3D printed molds produced at DOE’s Manufacturing Demonstration Facility at ORNL. Precast concrete parts, poured from molds developed at ORNL, are shown at partner Gate Precast. Image: Oak Ridge National Laboratory. 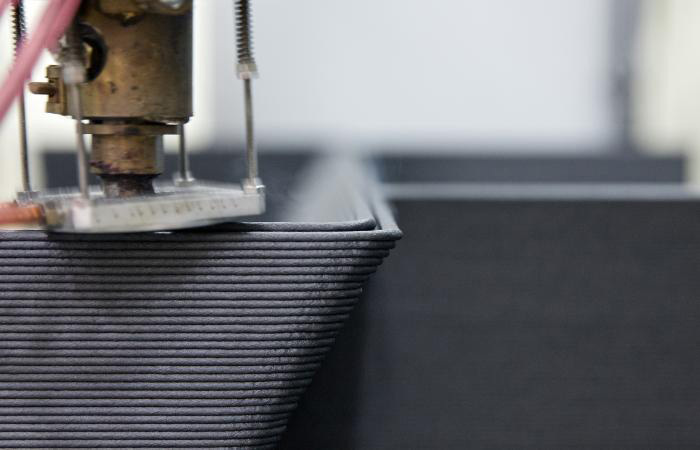 Read more about Making Precast Concrete Facades with 3D-Printed Molds on DOE’s Office of Energy Efficiency and Renewable Energy website (https://www.energy.gov/eere/success-stories/articles/eere-success-story-making-precast-concrete-fa-ades-3d-printed-molds). The research was conducted under collaborative research and development agreements between ORNL and industry partners. The project used resources from ORNL’s Building Technologies Research and Integration Center and Manufacturing Demonstration Facility and was funded by DOE’s Office of Energy Efficiency and Renewable Energy.